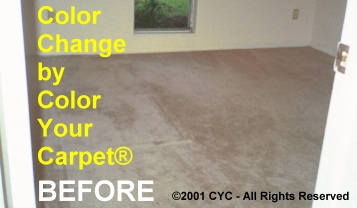 We can change the color of your carpet to a brand new color. 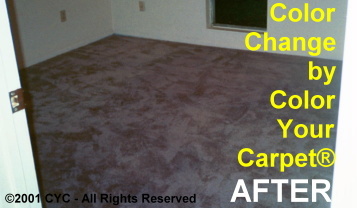 In this case we changed the carpet from discolored, stained and faded light gray color to a "Slate Violet" to match the rest of the room decor. This unique project was done at the Florida home of Diana Staley, a family friend, to please her two little girls who wanted to have a more colorful bedroom (Mom & Dad are painting the walls a fun lavender color too!). 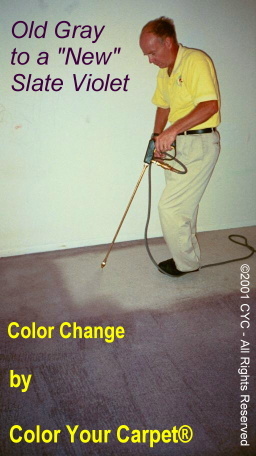 This job was part of our "Dyeing Boot Camp" for our newest Technician, Charlie, recently retired from the US Navy. 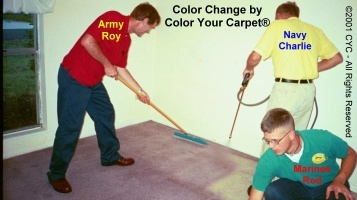 Now he's "dyeing" for us along with Rod who was a Marine and our franchisee, Roy, a West Point graduate. So we now have the ARMY, NAVY and the MARINES ready and willing to DYE for you!! !